Ok, I didn’t actually go to Slovenia. But I did go to The Allegheny Wine Mixer, a wine bar in the Lawrenceville neighborhood of Pittsburgh. They are currently focused on the Balkans—a wine region that I’ve been interested in for a while. Why have I been pursuing wines from this historically tumultuous part of the world? TIP: Find local wine bars with happy hours and/or half pour specials. Taste a variety of wine for less! No, it isn’t wine made out of oranges. Orange wine, or “skin contact wine”, is the result of white grapes treated like red grapes during the wine-making process. When making typical white wine, white grape skins and seeds are removed before fermentation. To get an orange wine, winemakers let the juice macerate and ferment with its skins and seeds, as is the case during red wine production. This results in a wine with stronger tannins than usual white wine, unique flavors, and, yes, a curious orange hue. Historically, skin contact wine was a speciality in Slovenia, Georgia, Croatia, and northeastern Italy, specifically Friuli-Venezia Giulia. Given its recent surge in popularity (hipsters love this stuff), it is now made all over the world with a variety of grapes. Both in the past and today, the most common grape is Pinot Grigio/Pinot Gris. Orange wine is known for having some funky flavors, including overripe apple, nuts, smoke, pine, and dried citrus fruit. Kvevris (n.): Large, clay vessels used by Georgian winemakers. They are buried underground to ferment, store, and age wine, including orange wines. Unfortunately I haven’t had an easy time tracking down orange wine at the PA Fine Wine & Good Spirits. When The Allegheny Wine Mixer announced their fall focus, I got over there pretty quickly! Neither the orange wine nor the wine bar disappointed. The bartender poured me a half glass of Mansus Makovec Estate Sivi Pinot R, an extended skin contact Pinot Grigio from the Vipava Valley region of Slovenia. At first sniff and first sip, it was both exotic and familiar. On one hand, it tasted like dried lemons, dinged-up apples, brine, slightly overdone toast, and roasted walnuts. On the other hand, it kind of tasted like… more intense Pinot Grigio? Like a Pinot Grigio concentrate. It was both weird and immensely enjoyable. I had a hard time navigating its flavor profile and would be interested in what others think. 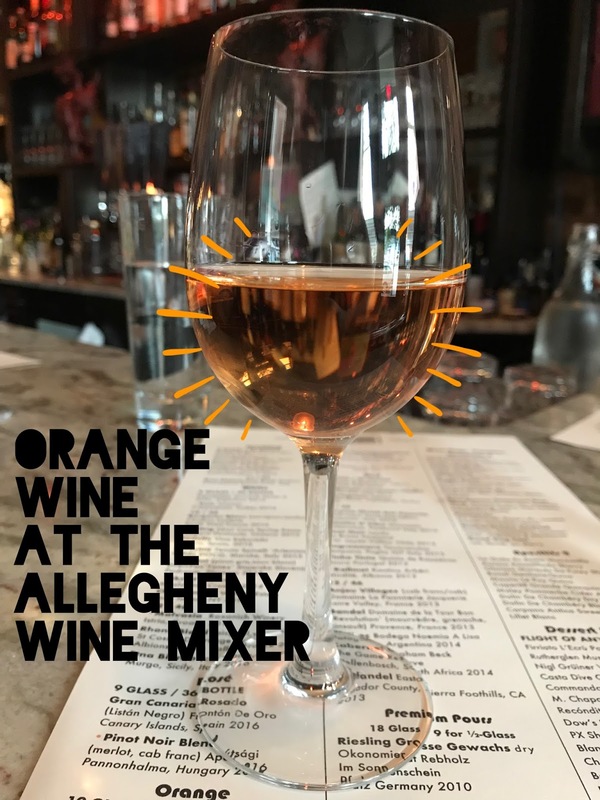 I’ll definitely go back to The Allegheny Wine Mixer and not just for the orange wine. The space was comfortable and welcoming, and the bartender was kind and attentive. I also had a nice, relaxed conversation with two other solo patrons. Most importantly: I went to Slovenia for only $4. During happy hour, most of their wines are only $4 for a half pour. 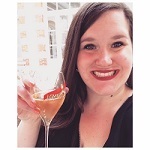 I was in hot pursuit of this wine, and then I got to taste it for just a few bucks—jackpot! During my next trip to this wine bar, I’ll be sure to check out their other featured wines, as well as their cheese selection. Do you have a favorite wine bar? Leave me a comment and I’ll add it to my list!